Firemen from the Mason, New Haven, and Middleport fire departments were called to the scene of a stove fire at the Peking Buffet restaurant on Gander Lane in Mason Thursday evening. Because the restaurant is located in the strip mall near Walmart, four stores received light to moderate smoke damage, according to a spokesman from the Mason Volunteer Fire Department. MASON — One fireman received non-life threatening injuries during a fire Thursday night on Gander Lane in Mason, according to a Mason Volunteer Fire Department spokesman. R.C. Faulk reported the unnamed fireman who serves on the Middleport Fire Department, was transported to a local hospital by the Mason County EMS, after being extricated from the building’s roof via a rescue basket attached to a ladder truck. The fire call came in shortly after 9 p.m. from the Peking Buffet restaurant, which is located in the center of the strip mall near Walmart. After assessing the scene, Chief C.R. Blake called in additional support from the New Haven and Community Volunteer Fire Department, as well as the Middleport Fire Department with a ladder truck. 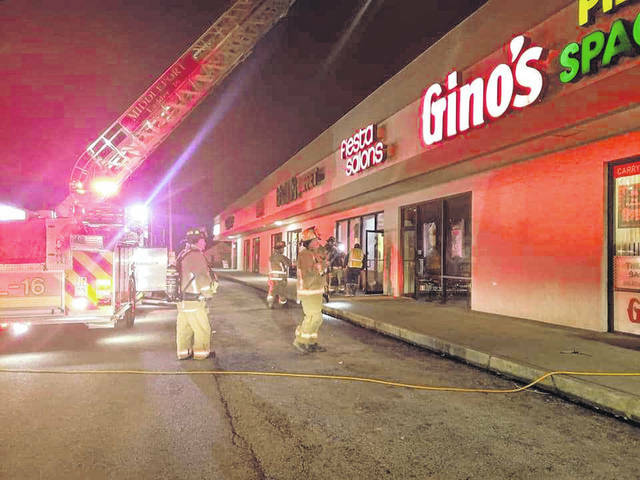 The initial fire, contained to a stove unit, was quickly extinguished, but four of the strip mall stores were filled with light to moderate smoke, according to the report. Firemen remained on the scene for approximately an hour and a half, removing the smoke from the remaining businesses with fans. The fireman was injured as he was on the roof checking for any fire there. He reportedly fell on an icy patch before being rescued and transported. Faulk said there were 21 firefighters on the scene with a total of seven pieces of apparatus. The West Virginia State Fire Marshal’s Office was called in for further investigation, and was notified of the on-scene injury.